Here's a masculine birthday card I made recently that has lots of metal on it! I started with PTI Soft Stone and die cut a Top Note. Then I cut some SB Sprockets dies in Blue, Red, Black, and embossed gold and silver. I added assorted brads in gold, black & silver, and a real piece of metal underneath the gold embossed circle. The matching mini brads were placed in a line with the Lili of the Valley sentiment. I used a Lil Inker diagonal stitched die for the blue panel, along with a large rectangle stitched die on the black card base. I was pretty pleased with the way this turned out. Thanks for stopping by - make it a good one! What a great masculine card! 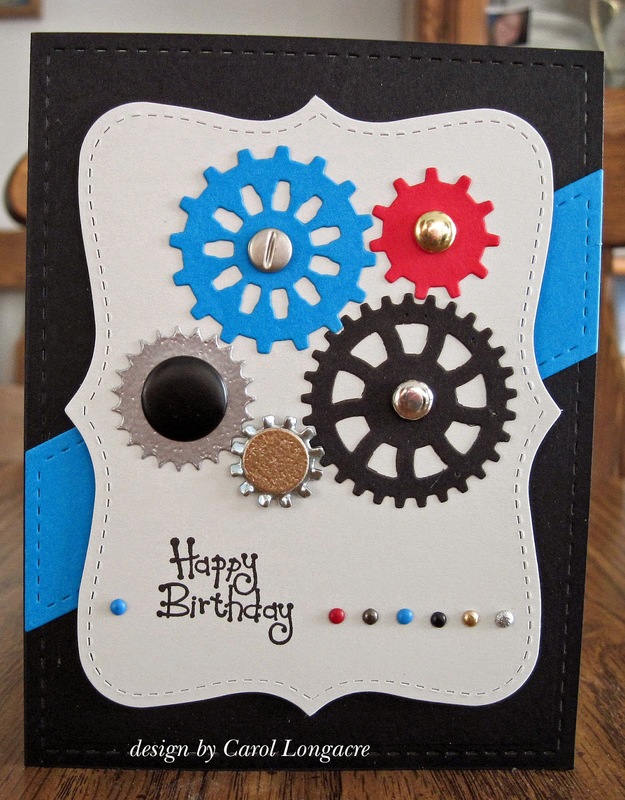 A brilliant masculine card Carol, I love the cogs and your contrasting colours look fabulous. The Top Note die is a my must have. Great masculine card you made with it! The gears are very pretty and love so much the stiched shapes!! Funny card, a lovely masculine CAS!! Great card Carol. Good one for the boys!! Woo hoo! Great guy card and I think the stitching on the top note and the diagonal strip works just right. Nice idea to have all the colored brads along the bottom with the sentiment. Have a great night. This is so fun! Love the use of all the metal.. really makes for a great guy card. Another terrific card Carol! Great use of snippets and I love that you added colour as well. Great card, Carol. It has a wonderful masculine feel! LOL! I love that you used gears, spockets, and all sorts of metal on it but your card has bright happy colors on it and not all grunge and dark metal (nothing wrong with that but I like that you can do otherwise).